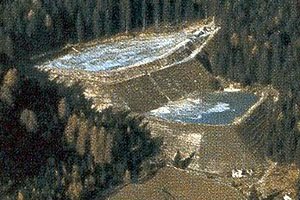 The Val di Stava Dam(s) collapsed on July 19, 1985 at 12.22.55. 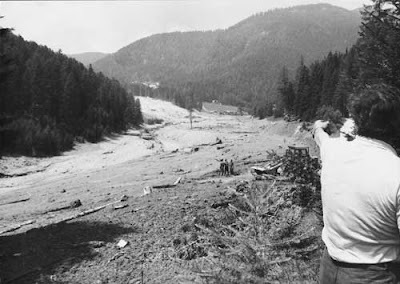 The mudflow caused by the break of two dams above the village of Stava, near Tesero, northern Italy, resulted in one of Italy's worst disasters, killing 268 people, destroying 62 buildings and demolishing 8 bridges. Fig.1. 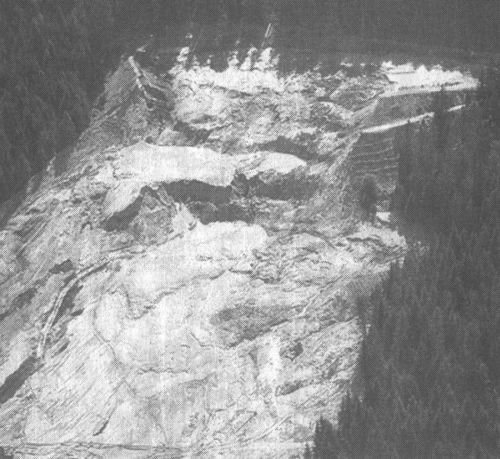 The destruction in the valley (image from Wikipedia). The dammed basin was used to collect and store the slag heap of a Fluorite-mining company. The dam was situated 150m higher and in a distance of 800m from the last buildings of the village of Stava. In 1969 the first basin reached a height of 25m, and it was decided to build a second basin above the existing one. The dams were build simply by separating coarse material from water and mud, and using the sand, pebbles and rocks as material for the basin itself, a mode of construction adequate only for small basins. A second basin was then build direct overlying, and leant in part on, the first. In 1969 the height reached by the upper basin was 34m, only 9m were authorized, the two dams were in total 50m high. Fig.2. The two basins, after a contemporary photography (figure from ANNOVI). Fig.3. The remains of the two basins after the collapse (figure from LUCCHI 1995). In 1974 the administration of the commune of Tesero (distant ca. 5 kilometres) demanded a security and stability control for the two basins, the (today as incomplete regarded) study was carried out in 1975 and concluded that the gradient of inclination of the dams was “extraordinary” and the stability of the construction “at the limits”. Nevertheless the mining company supplied to the authorities a positive security report, and the dam in the following years could be heightened, with the only compromise that the inclination was reduced to 40°. Between 1978 and 1982 the basins were not in use, only in 1982 until 1985 they were used to store the spoile pile of the mine “Prestavel”. In these twenty years the dams and basins were never again controlled, not by the mining company, neither by the public administration responsible for mining activities in the Province of Trento. The upper dam broke first, slumping in the subjacent, and so leading also to the collapse of the lower dam. Around 180.000 cubic metres (from the total volume of the dams of 300.000) of mud, sand and water were released into the Rio di Stava valley and toward the village of Stava at a speed of 90 km/h. Additionally 40 to 50.000 cubic metres were eroded by the primary wave from the underground and incorporated in the flow. The mudflow reached the village after 50 seconds crashing through the village, the flow then continued for three minutes until it reached the Avisio River 4.2 km away, destroying everything in its path. An investigation into the disaster found that the dams were poorly maintained and the margin of safe operation was very small. 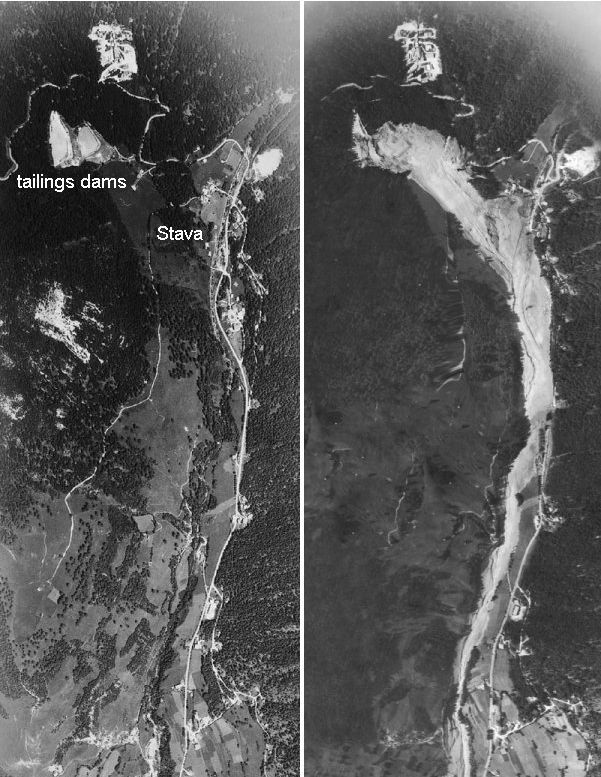 As last trigger of the failure is considered a leak of water, caused by a pipe in the upper dam, used to drain water, which had been bent by the weight of sediments. The increasing water pressure of the bunged up dam, in combination with the water saturation weakening the sediments of the dam wall, caused probably the collapse.